27-December-2007 : Show The World Where You’re Coming From…………Show The World Where You’ve Been! OK, fellow photog, fellow former news photographer, fellow Connecticut resident Seshu Badrinath (www.seshu.net) must be having a lot of free time during the holiday season because he is just finding subjects for me to write about this week here on Flying With Fish! Today Seshu sent me a link to some of the coolest total flyer nerd clothing available out there, Hub Wear (www.hubwear.com). Hub Wear has a cool little interface that allows you to customize your own “route shirts” The front of the shirt has where you’re coming from and headed to, the back lists the return route. Why not JFK-FLL (Ft. Lauderdale/Hollywood International Airport)? The most common single flight I take now is one I refuse to put on a shirt, HVN-PHL / PHL-HVN , I am not putting the Philadelphia International Airport on my shirt! Great city, but wow that airport needs some serious help. Anyway, show some pride in your home airport and the airport you frequent most! Great blog man! Thanks so much for sharing with us. My home airport is PHL and I completely agree with you. Big changes are needed there. I would have a hard time ordering a shirt with PHL on it too! What a mess! I am glad you have found my Blog useful for you. My goal is to make travelers as informed as possible, with whatever information is at my fingertips. Traveling as a photog can be daunting and it is getting more complex everyday. It does not have to be a challenge………even when it is a challenge. As for PHL, it does need some serious help! I have at times preferred to fly from BDL or PVD (rather than HVN which is about 30 min closer than the other two airports) just so I could avoid having to transit through PHL. PHL won’t be on my HubWear Shirt! Hi Fish, this is Sara from Hubwear. Thanks for mentioning our shirts on your site! 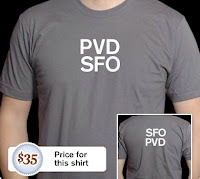 I just wanted to let you know that we could totally do PVD-ATL-SFO, or any other combo you’d like. Our website interface only allows for two airports at this time, but we’ve made shirts for friends with up to seven on one side! Each additional code is $3. If you’re interested, I encourage you to contact us through the website – we’d be happy to make any route you travel.